This step-by-step guide will walk you through setting up a scheduled file backup job in NovaBACKUP combined with configuring a data retention policy so that you don't run out of space over time. This is an example of a four week retention policy. One Full backup every Saturday with daily Differentials. This guide also details setting up a backup "Device" pointing to your network share/NAS or SAN for your target destination device. NOTE: Disable the Recycle Bin option for your Network Share that will store your backups. If your storage device will be a locally attached device e.g. internal hard drive/USB drive proceed to "Configure Backup Job(s) (Part 2)", no need to configure anything here. Setup your Network Device: In NovaBACKUP on the Home tab click on [Add Network Device] or open the Device tab and click on “Add”. In the drop down menu select “Network Device”, click "OK". Under “Device Name” give it a simple name, my example is NasBackup. Under “Network Path” type in the UNC path or browse for it. “Domain Name”, “User name”, and “User Password” are all optional depending on how your network device is configured on the network. NOTE: These credentials are those utilized to connect to the Network Share, for most devices you will use "admin" or "root" as the username. Click on "OK", if any of the above fields are incorrect, an error message will appear. If correct you will be taken to the Home tab, and see your device listed on the device tab. Configure your Default Setting to run as an administrator, change the default backup location, and configure default backup notification emails. Click on the NovaBackup logo on the top left corner and choose "Default Settings". Click on “Default settings”, Click on the “Run as Tab”, put a dot on “Run as specific user”. 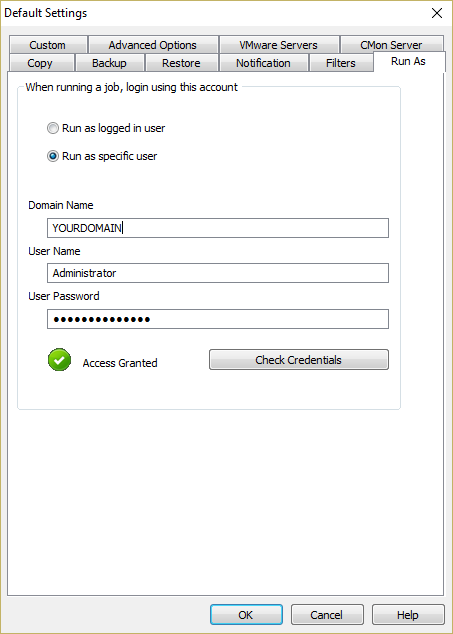 Fill in your Domain Name, User Name, and User Password. (Most home users will not be in a domain.) Click “Check Credentials” to confirm you have entered all the correct information. Change the default backup location to the previously added network device to ensure the network credentials are saved for Retention jobs. OPTIONAL If you would like to receive notifications click on the “Notification” tab. Put a checkmark next to “E-mail’. Put a dot next to always, if you want to be notified when NovaBACKUP completes any jobs. (You can select any option here depending on your needs for notification) Click on E-mail Settings, Fill out all the necessary settings here (the SMTP settings are optional, depending on your environment) and click “Test E-mail Settings”. A pop-up with will appear on your screen stating, “Test email sent successfully”. Click on “Save”, click on “OK”. Now close NovaBACKUP for the universal settings to take effect. Reopen NovaBACKUP, if you closed it, to continue. If this is your first backup, in the field next to “Backup Name”: replace “My Backup” with a name that’s appropriate for your computer. For this example it’s “Lemonade Stand Full Weekly”. This will make a script called “Lemonade Stand Full Weekly.nbk” If you have made backup jobs before click on the Novastor logo and click on “New Job”. Select the important items you want backed up, in our example the Lemonade Stand Folder contains our invoices so this is what we will backup. Click on [Backup to...], select your appropriate backup destination. NOTE: The previously added Network Device will be in the list on the Select Device dialog. For this example it is my local hard drive E. In “Media name” we suggest naming your backup file the same name of the script to keep consistency. In this example my backup file will be called “Lemonade Stand Full Weekly” it will create a file called “Lemonade Stand Full weekly.nbd” click on “OK”. Click on “Settings”. Under the “Write Mode”, click on the drop down next to “Mode:” change “Overwrite Media” to "Append to Media". This will create a new Full Backup file every time the “Lemonade Stand Full weekly” backup is run. Leave the “Backup Mode” to full since this is our weekly full backup. Click on schedule a prompt will ask you to save your changes, click on yes. You will notice the name of the file is “Lemonade Stand Full weekly” click on Save. In the schedule, you will notice your credentials already filled for you. In the drop down menu next to “Type of Schedule” set to “Weekly”. Under “First Run”, click on the drop down next to “Date” and select a date. I would suggest a Weekend Date. Next go to the drop down menu next to “Time” and select a time. I would select a time in the late evening. So for this example we have set a weekly backup every Saturday night at 11:00 PM starting September 27th. Now when you open the Schedule tab you will see your scheduled job listed there. Create a retention policy for our Full Backup job: While on the Schedule tab, Click on [Backup Retention...], the Configure Backup Retention window will pop up, click on “New”. A new window will pop up prompting you for a “file name”. In this window we suggest you put the name of your backup script with the word retention after it. In this example it would be “Lemonade Stand Full weekly Retention”. A new window will pop up asking to confirm changes click on yes. Next we will set the policy. On the basic tab, under “Keep backups using this setting:”, click on the drop down and change to count. (In this drop down you can set your retention to be based on “Age/Count/Age and Count”) For simplicity we will keep this to count. Under “Minimum valid backup count” change to 4. This will keep 4 of your current backups in place and will remove the oldest first before going to the 5th. Under “Backup type to process:” click on the drop and select “Normal Backup”. Click on the Advance tab. Below “Backup media type to process:” click on the drop down and change to disk. 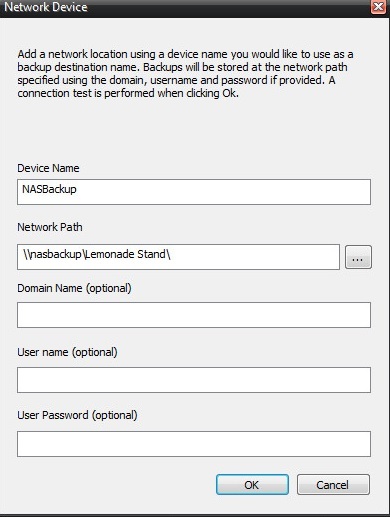 (In this example we are writing to disk if yours is tape, select tape) Below “Process only backups containing this media name:” input the name of your backup file in this example it’s “Lemonade Stand Full weekly”. A new pop up will request a filename it should already be filled with “Lemonade Stand Full weekly Retention”. Now we will add the retention policy we just created to the schedule. Under the Schedule tab click on “Add”, a new window with the schedule options should popup. Next to “Job Name”, Click on the drop down menu and a new window will popup. Open the “Utility” folder, then select the Lemonade Stand Full weekly Retention.nbk file. This will take you back to the “Schedule Options”. Next to “Type of Schedule” select “Weekly”, In the drop down next to "Date" select the Saturday night your Full Backups run. In the time field enter a time before your Full Backup job runs. For this example my retention script will run 15 minutes before my Weekly full Backup it will run at 10:45 PM weekly. Now you will see your Full Backup and the associate retention job in your schedule. Next we create a new job for our daily Differentials. Click on the white piece of paper icon and click on “New Job”. Replace “My Backup” in the “backup Name” field with “Lemonade Stand Diff Daily”. This will make a script called “Lemonade Stand Diff Daily.nbk”. Select the important items you want backed up, in our example the Lemonade Stand Folder contains our invoices so this is what we will backup. Click on “Backup to..”, select your appropriate backup destination. For this example it is my local hard drive E. In “Media name” we suggest naming your backup file the same name of the script to keep consistency. In this example my backup file will be called “Lemonade Stand Diff Daily” it will create a file called “Lemonade Stand Diff Daily”. Click on “Settings”. Under the “Write Mode”, click on the drop down next to “Mode:” change “Overwrite Media” to Append to Media. This will create a new Differential Backup file every time the “Lemonade Stand Diff Daily” backup is run. Change “Backup Mode” to Differential since this is our daily differential backup. You will notice the name of the file is “Lemonade Stand Diff Daily” click on Save. In the schedule, you will notice your credentials already filled in for you. In the drop down menu next to “Type of Schedule” set to “Daily”. Next go to the drop down menu next to “Time” and select a time. I would select 11 PM to coincide with our weekly backups. Below “but only on these days” check mark Monday through Friday. So for this example we have set a daily backup every day M-F at 11:00 PM Starting September 24. Now click on the Schedule tab you will see your schedule job listed there. Now we will create a retention policy for our Backup job. 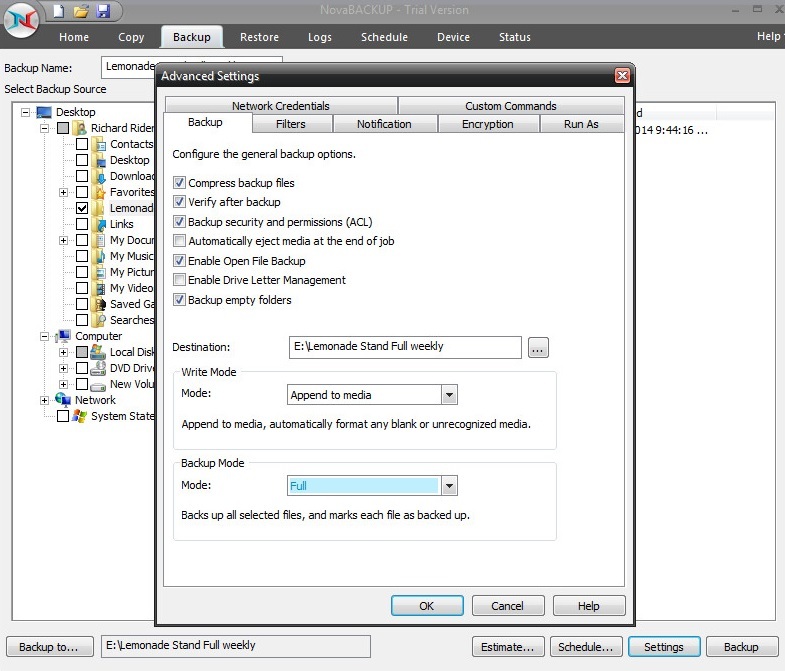 Click on “Backup Retention , the Configure Backup Retention window will pop up, click on “New”. A new window will pop up prompting you for a “file name”. In this window we suggest you put the name of your backup script with the word retention after it. In this example it would be “Lemonade Stand Diff Daily Retention”. Now we will set the retention policy. On the basic tab, under “Keep backups using this setting:”, click on the drop down and change to count. (In this dropdown you can set your retention to be based on “Age/Count/Age and Count”) For simplicity we will keep this to count. Under “Minimum valid backup count” change to 20. This will keep 20 of your current backups in place and will remove the oldest first before going to the 21st. Under “Backup type to process:” click on the dropdown and select “Normal Backup”. Below “Backup media type to process:” click on the drop down and change to disk. (In this example we are writing to disk if yours is tape, select tape) Below “Process only backups containing this media name:” input the name of your backup file in this example it’s “Lemonade Stand Diff Daily”. A new pop up will request a file name it should already be filled with “Lemonade Stand Diff Daily Retention”. Now we will add the retention policy we just created to the schedule. Under the Schedule tab click on “Add”, a new window with the schedule options should popup. Next to “Job Name”, Click on the drop down menu and a new window will popup. 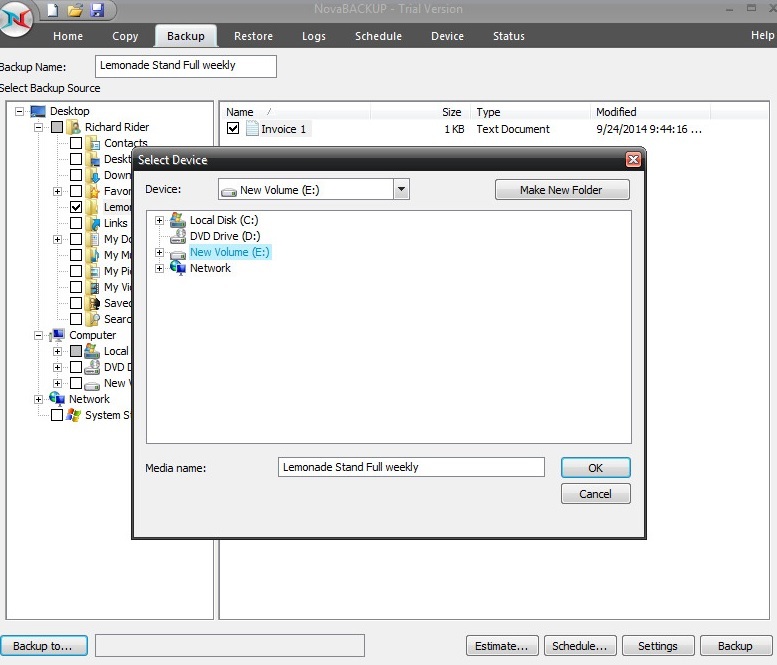 Open the “Utility” folder, then select the Lemonade Stand Diff Daily Retention.nbk file. This will take you back to the “Schedule Options”. Next to “Type of Schedule” select “Daily”.In the time field enter a time before your Full Backup job runs. Put a checkmark on Monday through Friday. For this example my retention script will run 15 minutes before my Daily Differential Backup, it will run at 10:45 PM Daily Monday through Friday. Now you will see your Daily Differential Backups and the associate retention job in your schedule along with your Full Backup and Retention.